"North America's largest evangelical group, Campus Crusade, has mobilized a small army of volunteers from Toronto to Vancouver willing to stalk movie-goers in the line outside cinemas. They plan to hand out biblical tracts debunking the movie's claim that Jesus had a child with Mary Magdalene and that the Catholic lay organization Opus Dei has covered up the scandalous affair for more than 2,000 years." "In the past, many Christian groups just said, 'Here's the way we think, and that's the way it is.' But times have changed. Talking about Christian issues takes communicating with people in means they understand and enjoy. In today's culture, this happens to be media and entertainment." He notes that religious advertising in Canada is in its infancy. He attributes this to the lack of trust in Canada towards organized religion. He quoted two well established numbers: "In the U.S., 40 per cent of people still go to church. In Canada, it's 19 per cent." Actually, there is a major difference between what people say they do and what they actually do. When church-going noses are counted, more accurate estimates of regular church attendance are 20% and 10%. "It's simple, they want it to work. The definition of insanity is when you do the same thing over and over and expect to get different results, and the church's traditional methods just weren't working. What's happened is that there are people in the church now who are saying, 'marketing doesn't make us a cult. We're not looking to strip people of their worldly assets. We're just talking about good communication'." "With the knowledge that this organization plans to 'stalk' our moviegoers outside of our theatres handing out unapproved material concerning a film we are presenting, we cannot lend support to this activity by running this campaign." 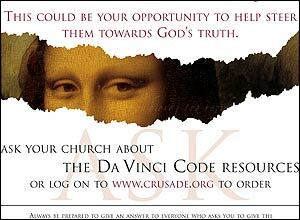 "Campus Crusade distributed cards and brochures that promote its Da Vinci Code Web site; the material reached as many as 30,000 individuals and churches across Canada. While the brochures contain a brief gospel message at the bottom, 'they are not what most people would consider as biblical tracts,' Mr. Douglas noted." " 'Ten students in Montreal said they might go out to a few theatres and hand out the material,' he added. '"A handful of students in Calgary said they might as well. This is not some massive army we have assembled'." "Reached at her office in Toronto, Cineplex spokeswoman Pat Marshall said it was not, in fact, her company's view that Campus Crusade planned to harass moviegoers. The e-mail that Cineplex sent to the organization was a 'mistake.' Ms. Rajh, she added, 'is misinformed'." "Cineplex won't show Christian group's ads," The Toronto Star, 2006-MAY-18.